Turkey is becoming a major hub for investors from the Europe and the Middle East, thanks to low property prices, wonderful locations and a welcoming society. But savvy investors are also wise to the fact that where other expats have settled, there is likely to be a better chance of relocating smoothly and fitting into the lifestyle, as well as snapping up property that could serve as rental generators. It is no surprise that the big cities of Istanbul, Ankara, Izmir, Antalya and Bursa have foreign national hubs. Istanbul because it is the main city that attracts working and studying foreigners compared to the likes of Antalya, which is the main tourism driver for the country. Izmir is regarded as the most Westernised city in Turkey, given its location, and so foreigners are always pulled to this lovely city for its laidback culture, sunny resorts and foreign-friendly outlook. And despite Turkey’s current predicaments with politics, Syria and terror attacks, the statistics have surprisingly shown a continuing rise in the number of people seeking short-term residence permits to stay permanently. The number of residence permits issued in 2016 stood at 490,799, compared to 263,128 in 2015. That, in itself, shows foreign residents still retain confidence in the country. Potential foreign investors will see that the top five of foreigners with residence permits are not from the European states. No, instead, Iraq, Syria Azerbaijan, Turkmenistan and Russia, are followed by Afghanistan, Georgia, Uzbekistan, Iran and Ukraine. The majority of Europeans will be scattered across the Turkish coastline from Izmir to Antalya, and within the Istanbul and Izmir conurbations, whether through work or retirement. 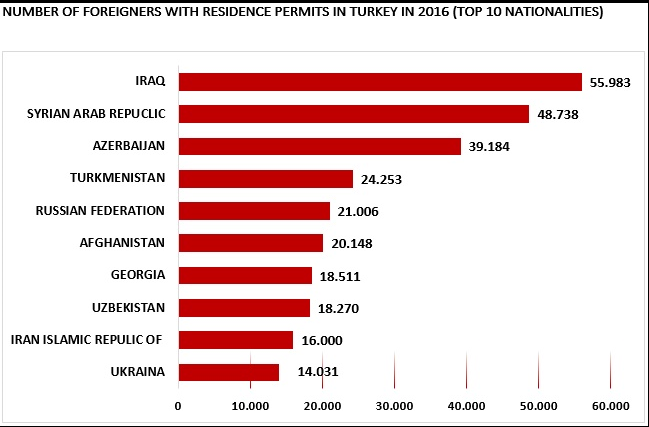 Equally those with the most short-term work permits range from Georgia withy 8,000 in first place to Ukraine in fifth with 2,476 permits, and through Uzbekistan, India, Moldova, Azerbaijan and Iran. Interestingly, the top five buyers in 2016 were from Iraq, Saudi Arabia, Kuwait, Russia and Afghanistan. The lure of property buyers from the Middle East is quite intriguing as it appears they do not even feature in the op 10 holders of residence permits. It hammers home the message that Saudis and Kuwaitis view Turkey as a prime investment location. The lure of property buyers from the Middle East is quite intriguing as it appears they do not even feature in the top 10 holders of residence permits. It hammers home the message that Saudis and Kuwaitis view Turkey as a prime investment location. 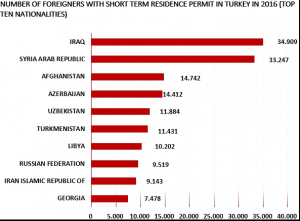 All these stats demonstrate the cross-cultural divide that Turkey now hosts. Encouragingly, this offers the chance for property investors to get well-researched locations to help narrow their choice before a decision can be made on property. Turkey has stepped up to entice more wealthy foreign property investors – with the chance to apply for citizenship. The country announced it will grant citizenship to foreigners who buy property worth more than $1 million, those who make a fixed capital investment of at least $2m or keep at least $3m in a bank account for at least three years. And with Istanbul set to be the property market generator for the next few years, given the amount of investment being ploughed into the transportation sector, such as the new third airport, the enticement could prove extremely popular. More so, for Middle Eastern investors who have not been put off by the internal problems that Turkey is currently embroiled in. 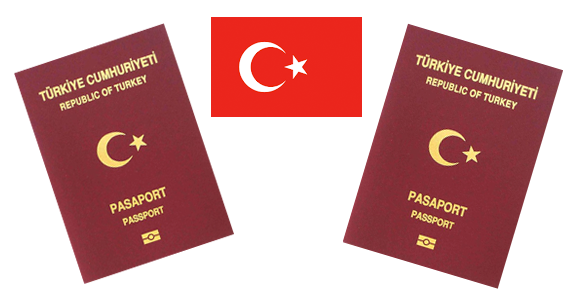 The likes of Spain, Portugal and the US offer residency rights, but full-scale citizenship is what Turkey envisages. It will be particularly welcome with those business or property investors who have retained faith in the country. The news also comes at a time when the Turkish Lira has been losing ground on the major currencies, including the US dollar and UK sterling. 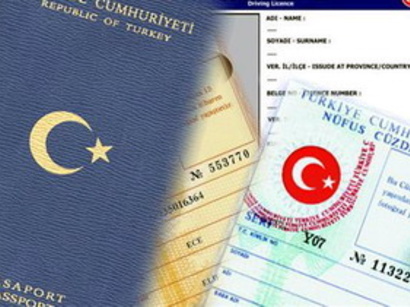 The citizenship issue is largely seen as helping to boost the property sector in a bid to boost the Turkish economy. Last year more than 21,000 houses and parcels of land were sold to foreigners, according to the Ministry of Environment and Urban Planning. 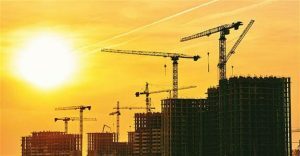 Over the past decade, according to the Ministry of Environment and Urban Planning General Directorate of Land Registry and Cadastre, 8,796 parcels of land and 102,745 dwellings have been sold. The buyers topping the list were Iraqis, Saudis, Kuwaitis and Russians, with foreigners snapping up more than 5,000 units in Istanbul and over 4,000 in the resort of Antalya. The government decree also applied to foreigners who can prove they have helped to create a minimum of 100 jobs in Turkey could also opt for citizenship. Alternatively, they would be eligible for citizenship if they hold government-issued bonds worth at least $3 million and have not been diversified for three years. National media reported that developers and real estate experts in Turkey hoped the move would help unlock a minimum of $10 billion worth of property to foreigners if citizenship or residence permits were offered. Our team has a combined 40 years experience in property management. Our General Manager is a member of the well known Institute of Real Estate Managers. By being the leading property management company in Istanbul we have been able to cut costs in the management of the properties we manage. Thanks to the use of state of the art communication and information technologies we are able to optimize our day to day tasks more efficiently. We provide detailed financial statements monthly and we are always contactable for any queries clients might have.